Neat...Jones on a tight budget. Still, there is Architecture there. I'd love to see a floor plan. Thanks for posting the link, Peter. There is quite a bit of 'Jones' left there. I had trouble trying to open up the pictures in Peter's link. If anyone else is experiencing similar issues, here is another site with them. Too bad Cherokee Village might as well be Bumfuq Egypt, it's so far away from anything resembling civilization. And there's a lot of prefinished paneling someone's gonna have to do something about. The listing does mention that "architectural plans are available" - of course, that would probably double the price ..
Hmm, I wonder if the seller has originals...? That would probably cost. Otherwise, if the archives at the University of Arkansas have already scanned this project, they will give digital copies to the homeowners for free. If they haven't, then there will be a smallish charge for each new scan. It's just a short walk from Thunderbird Lake, not far from Papoosa Park, a quick drive up Cherokee Road to Hardy and spitting distance from the Missouri line. You could drive up to the border of a Saturday night and spit on Missouri. What more could you want? I'm interested to note that the generic 1/4" random-plank wall paneling seems quite at home (at first glance) in a Jones interior. Amusing . . . Sad news from the Wright Society feed this week. 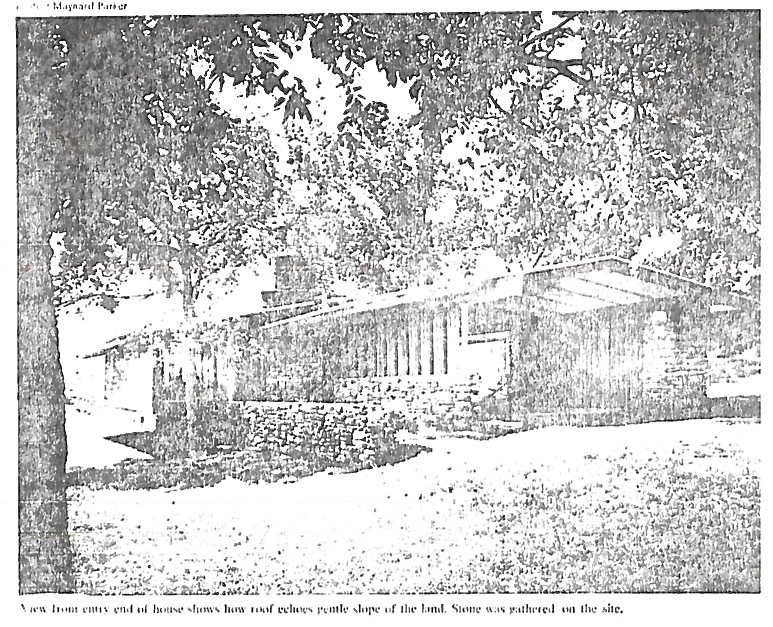 Jones' 1957 Adrian Fletcher house was mostly destroyed by fire on June 8, 2017. 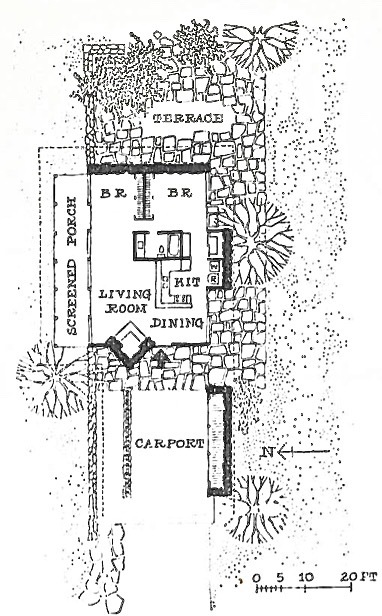 I'll send a floor plan from the 1959 magazine article to SDR for posting. This house was an architectural haiku...very modest but with an attention to detail that was found in Jones' most lavish houses...right down to the screen doors and kitchen stools. 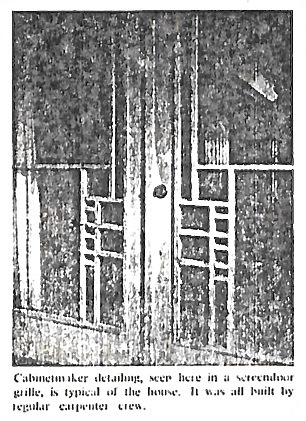 The wonderful cantilevered screened porch is out of sight to the right in the first interior photo, and visible at left in the second. One of Jones's major departures from Wright is the embrace of the vertical -- at the level of texture, at least ? On Dan's second link, hit the dark rectangular icon for the best whole-picture enlargement . . . Many thanks for posting those SDR. I studied and studied those pics and plan while writing a paper on Jones in college. I found the attention to detail and the elegant simplicity of the design inspiring. To me, this house was more important than some of Jones' later more lavish works. This is a real loss.